Call for additional pricing options. 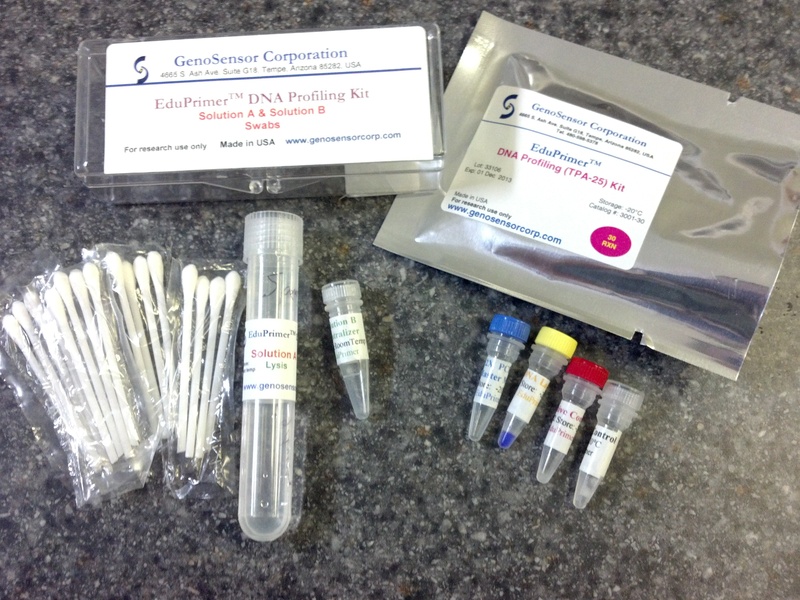 The EduPrimer™ DNA Profiling Kit is specifically designed to introduce students to the principles and applications of PCR, focusing on its real-life use of DNA profiling in forensics and disease research. The core kit is designed with 30 reactions total, meant for 24 student reactions and 6 control reactions. Option between two dimorphic genes in the Alu family (TPA-25 and PV92) for a maximum of four shifted DNA bands per student, demonstrating the power of PCR, and teaching the techniques to utilize it. Extremely simple and fast protocol for easy integration into classrooms such as Introductory or General Biology. Anyone can do it. Quick protocol involving isolation of students' DNA, PCR and electrophoresis, all completed within a 2.5 - 3 hour time frame. PCR reaction components only using TPA-25 primers. PCR reaction components only using PV92 primers. Detection of Alu by PCR: A Human DNA Fingerprinting Lab Protocol. DNA Learning Center. Cold Spring Harbor Laboratory. 1994.